Welcome to "How To Use Oekaki Guide"! I made this in order to explain common things that people ask about. If you have any questions, or anything to add to my post, please post here or PM me. Becca~ash wrote: Please state your questions so we understand, thanks. •If you just made an account on Chicken Smoothie, please post your first post somewhere else. I know that you won't read the posts on here and post non-understandable questions. You can now continue reading on. •PM a mod if you want your topic to be moved! •I suggest you to have prizes in competitions if you want for people to enter. Omg, plz click my pets! Plz plz trade with meee!!! •Respect the mods. They know what's right and what's wrong. •Please, don't open art shops here. That does not mean that your cover can't be drawn on Oekaki through. Here are common abbreviations that people use on oekaki. Fursona/Sona- Animal that represents you. RP- Although it stands for RolePlay, some people use it in content: "My RP charrie." Spam- Senseless posts like listed in rules. That's all I can remember at the time, if you have something to add, post here. •Rules, Intro & Abbreviations-You're here. Last edited by Misnake on Thu Mar 28, 2013 10:33 pm, edited 12 times in total. 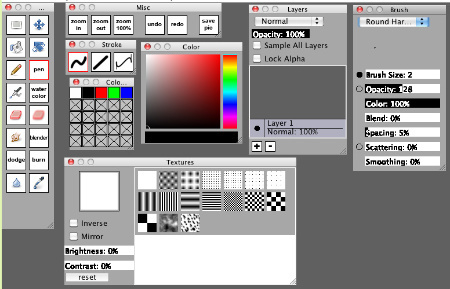 "Brush" Box, "Layers" Box, "Textures" Box, "Color" Box, "Misc" Box, "Stroke" Box, "Color Swatches" Box and "Tools" Box. To pick a color, you can pick from the rainbowy structure on the right, and to control its lightness you have the big square in the middle. You can choose if you want draw by hand(mouse), draw straight lines or draw curly lines. save colors you are using. automatically zooms back to 100%. Pick a texture. 'Nuff said. "Smudge", "Blender", "Dodge" and "Burn" tool, "Blur" and "Color Picker". Note: I was writing by every horizontal line. Also, in the top left corner, you have "Edit", "File", etc. This is clear enough, right? Last edited by Misnake on Fri Sep 30, 2011 3:28 am, edited 10 times in total. ChickenPaint is very similar to the original Oekaki, called ChibiPaint, but is also different in some ways. This will cover the features of ChickenPaint. 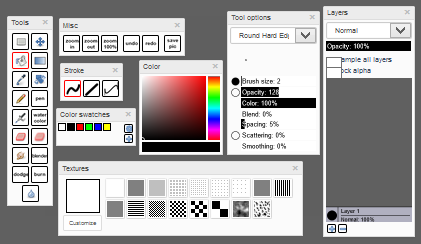 "Tools Options" box, "Layers" box, "Textures" box, "Color" box, "Misc" box, "Stroke" box, "Color Swatches" box and "Tools" box. You can pick from a rainbow of colors on the right and adjust its hue and saturation in the big square box in the middle. You can input hex colors by clicking the bottom rectangle which shows which color you are currently using. 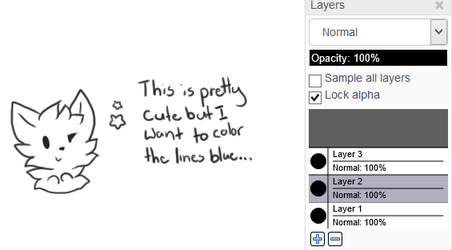 Just like ChibiPaint, this adjust how you want to draw. From left to right; you can adjust if you want to draw by freehand, straight lines or curved lines. You can pick from an array of textures here to add to your drawing if wanted. By every horizontal line; "Select", "Move", "Fill", "Gradient", "Color Picker", "Rotate", "Pencil", "Pen", "Airbrush", "Watercolor", "Eraser", "Soft Eraser", "Smudge", "Blender", "Dodge", "Burn" and "Blur". The select tool selects a rectangular area of your drawing and you can color it in or move it, the move tool moves whatever is on your layer, the fill tool fills in your drawing, the gradient tool creates a gradient blend between 2 colors, the color picker picks a color off wherever you put it, the rotate tool rotates your canvas, the pencil tool and pen tool are similar in that you can draw with both (The pencil tool being slightly sketchier while the pen tool is smoother), the airbrush tool lets you draw with a 'soft' pen, the water color tool takes the color your using and blends it when used, the eraser tool erases your drawing where you put it, the soft erase does the same thing as the eraser except makes it 'softer' (Like the airbrush), the smudge tool drags the color where you use it, the blender tool blends colors in your drawing, the dodge tool creates more saturated colors where you put it, the burn tool creates darker colors where you put it and the blur tool blurs your drawing. Last edited by Misnake on Mon Nov 14, 2011 4:29 am, edited 14 times in total. `nievegato wrote: Well,you have to click the pen tool,and set it to round pixelated.Then zoom in enough so that you can see every pixel and start to draw.Pixel drawing is usually small and detailed,though I have seen people how draw large pictures with pixel lines and coloring. Take the "Dodge Tool" for highlights and take the "Burn Tool" for shading. That's the easiest way. I have normal blue dog. I take lighter blue and make highlights, then lighter blue to make even better highlights. Same with the shading, you just go to darker colors. You can also use a black, or experament colour brushes to create shading. Simply start a new layer and set the opactity to around 30. This can be edited to how you like it, and how dark you like it. Draw around where you would normaly shade. It should come out looking like simple shading, you can use the blur tool, located in ''Effects" then "blur". Or you could use the blur tool to get it more accurate. Marquee Moony wrote: Basically what you do is you color your shading, any color you want (though something close to gray usually works best), then set the layer to "Multiply" using the drop-down list (Where it was "Normal") at the top of the layers box. Add all the layers you want (Background, Color, Lines, etc...And draw lines! ), take different colored pen/brush than the background and fill in the place inside of the lines. After you did that, you can click lock alpha button (When color layer is selected.) and careless go all over the place (Actually, you can color without going outside the lines.). 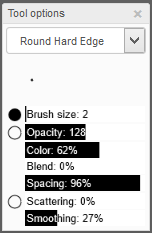 1.In a brush box, select the "Round Soft" type of brush. 2.Make "Smoothing" from 30-40% in brush box. 3.Draw lines. If you want more smoothness, you can eventually go to "Effects">"Blur">"Box Blur" and put "1" in the first box. 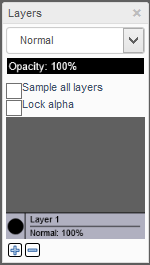 Before you even save the picture in oekaki, make sure that the "layer 1" is transparent/deleted. Then save the drawing, post it and right-click on it. Click on the "Open Image In New Tab" option. Around the end of the link, there says something like "auto&rev". Change "auto" to "png" so you see "png&rev". That will make the background transparent. In the brush box, you have something called "Scattering". Raise it up to 150-300% and try to draw a little. If it's scattering too much, make it lower to level you like. Click the bottom rectangle of the colors box where it shows the current color you are using and it will pop up a box with the hex code of that color. You can also type in hex codes with that box. Simply use the rotate tool and rotate the canvas vertically instead of horizontally, this is only supported in ChibiPaint 2.0 and ChickenPaint! You can do that by clicking this link to change your Oekaki version. Last edited by Misnake on Thu Jan 09, 2014 5:10 am, edited 20 times in total. Q: Can we bump our drawings? Becca~ash wrote: This button only appears when a topic hasn't been posted on for a while. I think its something like 6 hours. When you click it and go back to the subject, it will be bumped up and you won't be able to use it again untill someone posts, then again the same cycle. But try not to always bump up topics when they haven't been seen for a while, espiecaly oekakis. Q: I want to make a competition without lines or background! What do I do? A: There is written in the competition rules to post the competition in "Art Competitions" part of forum. A: That's because art shops don't belong to Oekaki part of forum, just adoptables. If you want to have art shop, please post it in "General Art Shops - Trading CS pets for custom-made art" part of the forum. 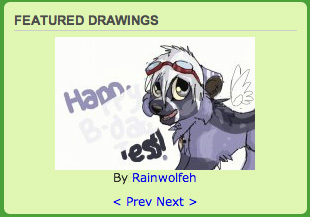 A: Featured drawing is the drawing that shows drawings of various artists on the front page. You don't get featured by asking people to like it or to comment. You get featured by mods who decide to make you it. Picture in example was made by Rainwolfeh. Q: What's the difference between "Intermediate Oekaki" and "Beginners Oekaki"? A: Intermediate oekaki is where lots of good and experienced drawers post. Beginners oekaki is the one for beginners. Sometimes mods move the drawings from beginners to intermediate or reversed. Intermediate Oekaki's have much more details, shading, background, etc. Enoshima wrote: An original character is a character you use or made. It can be based off something, but it can't be a copy. An original character us something that you use as, well, a character, and it's not a copyrighted figure such as pikachu or Michael Myers. To put it short and sweet, it's a character you use with an original design. Q: I edited some one else's oekaki, so it's a color-in. But i want to make it available to all people to edit for my contest. How do I do that? A: If you already posted, ask mods to move it to contest and it will be ok, as long as you don't claim lines as your own and have the permission of the original artist. Q: What all the different types of layers are, e.i. "Normal", "multiply", "Subtract", "Add", "Pin Light", ect.? I don't really get any of them. Becca~ash wrote: I know multiply is simply when it makes the top layer translucent and a tad bit of shine. Note: We will get further information about this. Q: Can I post a drawing I drew outside of Oekaki? A: Yes, but not on Oekaki. If you wish to post it, post it here. If you want to share your characters, post them here. Just remember to read Art/Image posting Rules if you haven't already. Q: How to rename layers? A: Double-click where it says "Layer #" (# being any number of the layer you want to rename) and type it in! Q: I'm having trouble with getting the Oekaki to work because of Java! A: If you are having problems using the Oekaki because of Java, you can refer to the Oekaki/Java problems & solutions thread! If your problem still isn't fixed, you can send in a help ticket or get help from fellow members in the CS Help, Suggestions, and Problems instead! Please keep in mind that if you are using Google Chrome you will have to try a different browser, as Google Chrome has dropped Java support and will not work with the Oekaki. You can also change your settings to ChickenPaint instead since that does not use Java and works on all browsers. Q: How do I access my saved drawings? A: You can find them by clicking on the New Drawing button, they will be under where you can choose your canvas size! Q: What is Lock Alpha? 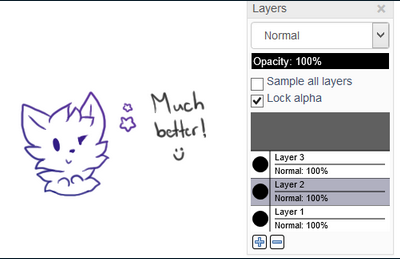 A: Lock Alpha is where you are able to color in whatever content is on the layer you are on, except that instead of having to carefully color it you can just hit the lock alpha and it will automatically let you stay inside whatever is on that layer! Note: This also works with the gradient tool! Q: How to get tablet pen pressure? What is smoothing?And how do I do it? wow, this is really helpful! Could you do one on how to use lock alpha? SilverHorse wrote: wow, this is really helpful! Could you do one on how to use lock alpha? RottieGirl, I'm gonna tell you for few minutes to be sure that I'm right. Last edited by Misnake on Thu Sep 29, 2011 6:05 am, edited 1 time in total. What about smoothing?I REALLY need to learn how to. Well done Sinamy, a good guide. Last edited by Zaroque on Thu Sep 29, 2011 6:11 am, edited 1 time in total.